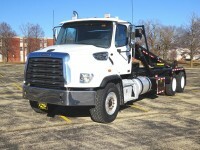 Rantoul Truck Center has a large inventory of New Or Used Roll Off Trucks for sale. We feature all truck makes and models with rolloff hoists by all manufacturers such as Galbreath, Rudco and more.Browse our inventory and find the perfect truck for your needs! Don’t see what you need? Contact us and let us know about the Roll-Off you are looking for – we have new trucks arriving regularly! All Body Capacities 60,000 Lbs.